Cocktails these days are a whole lot more interesting than back in the day when it was a shot-and-a-beer or a basic whisky-and-mixer. Now we've got fancy drinks, mixologists, and flair bartenders who spin and juggle bottles and do all sorts of fancy tricks before handing over your drink. I like a little show, but there's no way I'm going to be juggling expensive bottles of hootch. Trust me, no one wants to clean up that mess. This time, the "show" is provided by B'lure cocktail concentrate. It's sort of a like bitters, and it's made from a flower extract, and it's blue. Or, I should say that it's blue until it meets up with something acidic. Like, let's say ... a drink that has lemon or lime juice. But here's the deal. The color changes pretty quickly, so to have an impact, you need to add the extract while your guests are watching. Otherwise, you're serving them a pink or purple drink - the color you end up with depends on the drink. So far, I've only poured and mixed - but it would be fun to add the B'lure to ice cubes, or perhaps use them in a layered cocktail, so the guests would do the final mixing to change the colors. This cocktail is very similar to a margarita, but with gin instead of tequila. It works. Trust me. I've been testing this cocktail for a loooong time. You might want to adjust the sweetness on this to your liking. 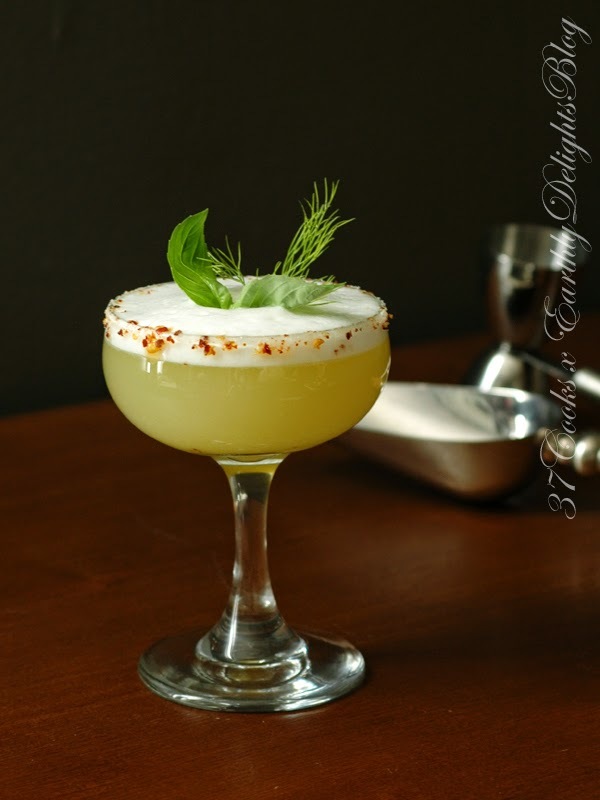 The tartness depends, of course, on how tart your lime juice is, but you also need to take into consideration how tart you like your drinks ... so make it more sweet or more sour. If this seems too strong for you, you can also add sparkling water or soda to tame it a bit. As far as the mixing, you could add the B'lure the way I did, or start with the B'lure in the glass with some water or soda and then add the gin and lime. Either way works. Just have fun with it! And - hey - if you don't happen to have any B'lure hanging around, this makes a tasty drink without the added color! Combine the gin, lime juice, and agave in a short squat glass filled with ice. Mix well. Pour the B-lure mixture into the cocktail while your guests watch. Garnish with something fun. I used a slice of starfruit. Most of the challenges thrown at the 37 Cooks involve food. There's been a lot of baking, braising, simmering, frying and grilling going on. Sure, once in a while there's a beverage that creeps in, but when you're working with sausage, or a baking book, or some spices, most of the recipes will involve food rather than drink. But the 37 are a thirsty lot, and they're just as creative in a glass as they are on a plate or in a bowl. The "It's Five O'Clock Somewhere" challenge proves that point. The cooks were asked to create a fun cocktail or mocktail and, as usual, they knocked it out of the park! Rumor has it that the testing was a lot of fun, but it's the results that matter. We think you'll be pretty impressed in the coming days, so belly up to the bar and enjoy! Sometimes you want something quick, snack-ish, yet still healthy. Let's say you're going to hang with your hubby watching a game, or you have kids who are roaringly hungry and need to eat right now! You need to make something simple, but good. That was the situation I imagined for myself when challenged to use Bilinski's Kale Balsamic Chicken Sausage. This fully-cooked sausage needs only a quick dash through a hot oven to be ready to serve. I combined it with a quick variation on cheese biscuits, and ta-da! Simple, healthy, quick and satisfying. NOTE: You could flavor the biscuits just about any way you wish! Omit the cheese, add herbs, have fun. Preheat the oven to 400°F - by the time the sausage rolls are ready to bake, the oven should be ready. Place a rack in the upper one-third of the oven. Put the self-rising flour and the grated cheese in a bowl, and toss it to coat the cheese bits with the flour. Mix in the cream until a shaggy dough forms. If it's too dry, add in a bit more cream or milk; the humidity can affect how biscuit dough comes together. You should be able to squeeze the dough into a cohesive ball without it being sticky or oozy. On a floured board, pat or roll the dough 3/4 of an inch thick and cut the dough into strips. Wrap each sausage with strips of dough in a spiral. 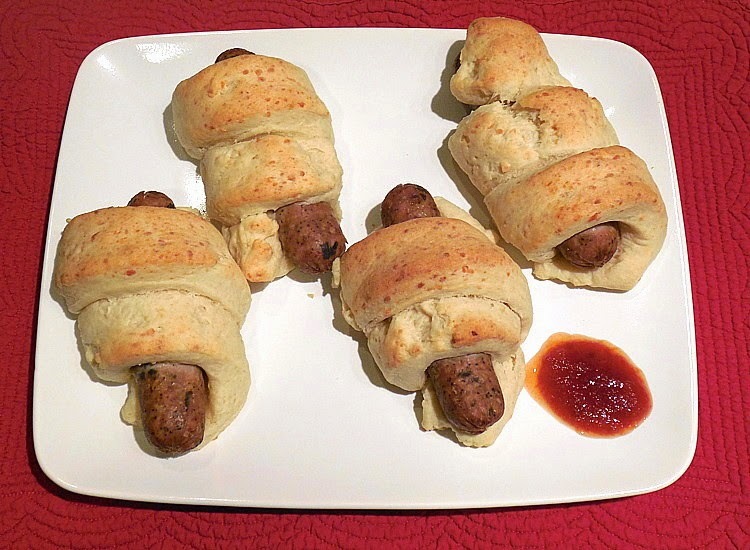 Place the dough-wrapped sausages on an ungreased baking sheet. Bake in the top third of the oven about 15 minutes, until the biscuits are golden and the sausages are hot. One of my father's favorites, made healthier by Bilinski's Kale Balsamic Chicken Sausage. This was often a breakfast treat on Sunday morning. Heat a large skillet over medium heat, add 1 teaspoon olive oil. Add diced peppers and onions to olive oil and saute for 10 minutes, until slightly soft. You want them to retain some texture. Set aside in a separate bowl. Add diced potatoes to skillet with 1 teaspoon olive oil. Saute over medium heat until golden brown and tender, about 15 minutes. Mix into peppers and onions in bowl. Cut sausage into slices and brown in skillet over medium heat in 1 teaspoon olive oil for about 5 minutes. Add peppers, onions and potatoes back into the skillet. Stir to blend and add salt and black pepper to taste. Scramble eggs and slowly add to the sausage and veggie mixture. Reduce heat to low, stirring continuously to break up curds while the eggs are cooking. Remove from the heat when the eggs are nearly set, they will continue to cook off of the heat. Serve with thick toast for breakfast or a mixed greens salad for lunch or supper. This makes a nice brunch dish and is not only delicious, but healthy, too! Preheat oven to 400°F. Heat a Dutch oven over medium-high heat, add olive oil. Add onions, saute 3 to 4 minutes, then add garlic and saute one minute, stirring constantly. Mix breadcrumbs with melted butter and spoon over spinach mixture. 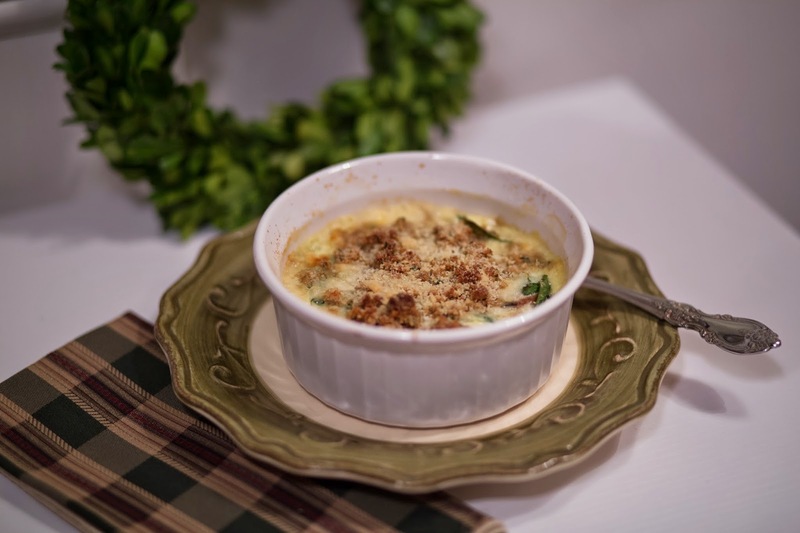 Top with Parmesan cheese evenly over each ramekin. Bake for 20 to 25 minutes, or 30 minutes if using casserole dish. Like many avid cooks, I have a very genial relationship with several people who work in the produce department of my regular grocery store. I often ask them to slice a cabbage in half or when certain things are in season. 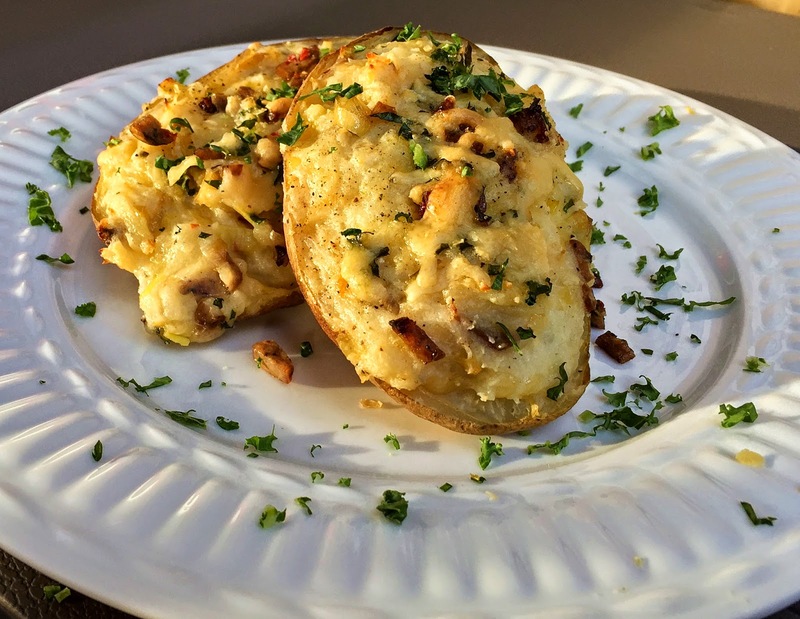 Shopping for the Bilinski's ​Healthy Kale ​Balsamic Chicken Sausage Challenge, however, one of these genial gentleman helped me name these tasty twice-baked potatoes. See, I was looking for leeks. Finding none, I approached him to ask, "Do you guys have any leeks today?" "Thank God," he said, looking relieved. "Are you the plumber? We've been waiting for you for hours!" It took me a beat to understand the pun, and it took him only moments to locate some of the delicious veggies for me. 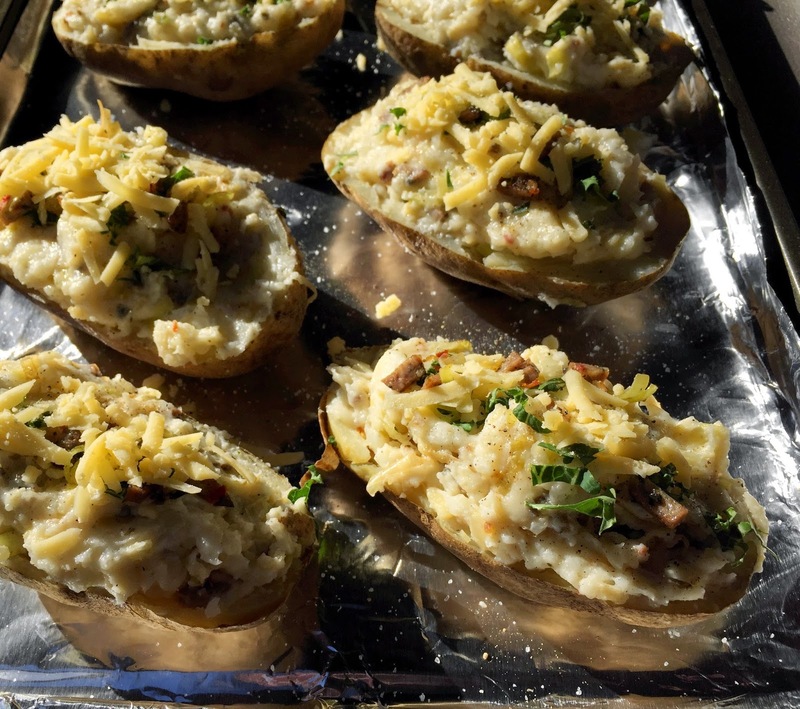 But since these twice-baked potatoes are full of leeks (leaks!) and kale (which is good for your, ahem, plumbing) the dish's title was born! Serve these potatoes as a light main dish or a delicious side with the protein of your choice. ​Preheat your oven to 400°F in order to bake the potatoes the first time. After washing them well, pierce each potato all over with a fork, then wrap the spuds in aluminum foil. Bake for about 90 minutes, or until the potatoes are tender to the touch. Set aside and allow to cool enough to handle. Meanwhile, set a medium sauce pan on the stove over medium heat. Add your butter and olive oil, and once melted, stir in your leeks. Season with salt and pepper, and saute the leeks for about 10 minutes until they're tender, but not brown, turning down the heat to medium-low if necessary. Add the Bilinski's Kale Balsamic Chicken Sausages, ​stirring the meat into the leeks and cooking until edges are crisp, about 3-5 minutes longer. Scoop leak and sausage mixture into the bowl of your mixer - if you have one. If not, transfer to a bowl in which you can use a masher. Once the potatoes are cool enough to handle, slice them carefully in half lengthwise. Using a spoon or a melon baller, scoop out the tender interior of the potato, leaving only a shell of intact potato near the skin. Cover a cookie sheet with foil and place the shells upon it. Place the scooped potato into the bowl with your leeks and sausage. Turn the mixer on low - do not over mix or you risk gummy potatoes - and gently mash everything together. Add 3/4 cup of the cheese to the bowl along with the sour cream. Season well with salt and pepper, salting aggressively. Gently mix again. Spoon your filling into the prepared potato shells. Top with the remaining 1/4 cup of cheese and ribbons of kale, if desired. In your still 400°F oven, bake the potatoes again for about 25-30 minutes, or until the filling is crisp and golden brown. Cut each squash in half, scoop out seeds, brush with olive oil and place, cut side down, on a parchment-lined baking sheet. Bake at 400°F degrees for 50 to 60 minutes or until evenly baked through and tender. Turn over and prick with toothpick to check tenderness of squash - you are aiming for baked potato tenderness. Fold in baby kale (or spinach) and fill scooped out center of baked squash with chili. It should be slightly heaping. Place on parchment-lined baking sheet and bake at 375°F for 10 to 15 minutes. Take out of oven and garnish with grated Irish cheddar. (Rises slowly...) My name is Louise Chiffonade Brescia and I am rice-impaired. My rice usually comes out like joint compound and after over 40 years of cooking, some of it professionally, I thought I had given up on rice altogether. One day I had an insatiable craving for paella and this dish was born. Hearty enough for a crowd, yet quick enough for a weeknight, I hope you enjoy this dish. Heat large Dutch oven over medium/high heat until small wisps of smoke rise. Pour in oil. Season chicken with salt and pepper and cook, skin side down, till skin is browned and crisp, 6-8 minutes. Transfer chicken to a plate. Add onion, pepper and saffron to the pot and lower the heat to medium. Cook, stirring occasionally until soft, 6-8 minutes. Stir in a large pinch of salt and pepper, garlic and paprika and cook 2 minutes. Stir in rice and stock. Reduce heat to low, nestle chicken thighs, skin side up, into rice and vegetables (reserve chicken plate - it will be used again.) Bring to boil, reduce to simmer, cover and cook 15 minutes. Again, remove chicken to reserved plate. Fold in raw shrimp, Bilinski’s Kale Balsamic Chicken Sausage rounds and olives and continue cooking another 15 minutes. Taste and adjust seasoning if necessary. Sprinkle with chopped flat leaf parsley. Serve hot. Hunter and I have resolved to be more conscious of how we live and that includes what we eat. He's quit smoking, we're working out and we are eating cleaner. Roasting vegetables is an easy way to eat clean. It's dead simple and is a technique that works for a myriad of veggies. Bonus, you get dinner on the table without spending a lot of time standing at the stove. I usually roast more than I need for one meal, because I can always use leftover roasted vegetables in salads, soups or frittatas. Sometimes I will have half an onion, a bit of fennel bulb, random cauliflower pieces, whatever, I just roast it all together. So don’t feel bound by the combination of vegetables I used, feel free to use whatever you have that needs eating. Adding any Bilinski's Chicken Sausage to a pan of roasting vegetables couldn't be easier. Preheat oven to 450°F. Line a rimmed sheet pan with parchment paper. Peel the carrot, parsnip, sweet potato and rutabaga. Slice into uniform chunks so they cook at the same rate. Remember, the smaller the dice the faster they will cook. I kept mine about an inch thick. Slice the fennel bulb and onion into wedges so that the wedges are still connected at the base. Mound all the vegetables and the garlic onto the parchment-lined baking sheet and drizzle with about 2 Tablespoons of the olive oil. Using your hands, toss to coat evenly, spread out the vegetables in a single layer. Use plenty of olive oil to ensure that everything cooks evenly and gets nicely golden without drying out. Season with kosher salt, freshly ground pepper, a pinch of crushed red pepper flakes. Bake for 15 minutes. Meanwhile, slice the Bilinski's Kale Balsamic Chicken Sausage and toss with a little olive oil. Once the vegetables have roasted about 15 minutes, add the sausage and roast an additional 10-15 minutes until the sausage is heated through and the vegetables are tender and golden brown along the edges. Remove from oven and drizzle with a splash of balsamic vinegar and a little more olive oil. I served a little salad of kale, radicchio, dried cranberries and pumpkin seeds with this. Bilinski's Sausage offers the finest organic, natural and healthy chicken sausages made today. With an amazing array of flavors, their sausages and meatballs offer myriad options for tasty, healthy meals. 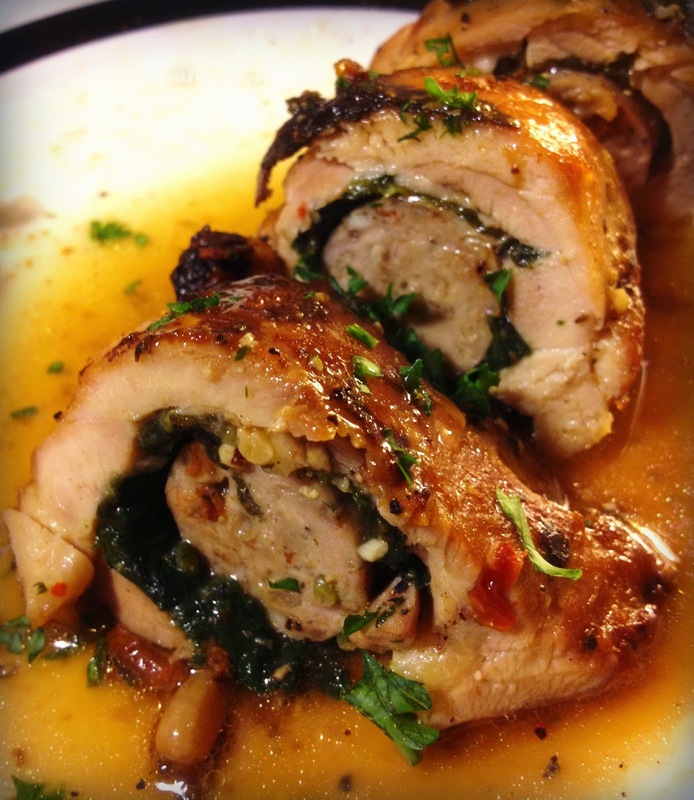 These stuffed chicken roulades combine flavorful layers of ingredients and textures. The herbed spinach filling, rich with Manchego, with a slight crunch from toasted pine nuts, provides a tasty cushion to the star of the show: Bilinski’s Kale Balsamic Chicken Sausage. This delicious, slightly sweet and tangy sausage is the perfect centerpiece to these roulades, made with boneless, skinless chicken thighs (which are the perfect size for a half link!) A quick pan sauce takes this main dish to the next level of flavor and presentation. Heat 1 Tablespoon olive oil in a large ovenproof skillet over medium heat. Add shallot and cook until slightly translucent, about 30 seconds. Add garlic, stir and cook just until fragrant, about 10 seconds more. Do not burn. Add spinach and toss, stirring until wilted and cooked down, about 2-3 minutes. Sprinkle with salt, pepper, thyme, tarragon, Aleppo, white pepper, and brown sugar. Stir to mix well, then remove from heat. Place spinach mixture in a large bowl. Stir in Manchego and pine nuts, combining well. Wipe out skillet, and set aside. On a baking sheet or cutting board, lay out chicken thighs “skin” side down. Remove any large pieces of fat and flatten any thick areas by carefully slicing and laying meat open with a sharp knife. Take care not to cut the flesh all the way through. Season with salt and pepper. Carefully spoon about 1/4 cup of the spinach mixture along the chicken, trying to maintain an even layer, and press down into the chicken meat. Lay a half-link of Bilinski's Kale Balsamic Chicken Sausage on top of spinach. Bring ends of thigh up and over the sausage, and secure tightly with toothpicks. Season the outside of the thigh with salt and pepper. Set aside. Repeat until all thighs are stuffed and secured. Preheat oven to 350°F. Heat remaining olive oil in skillet over medium-high heat. Add thighs and cook, browning well on all sides, about 2-3 minutes per side. Turn carefully so stuffing is not lost. Once thighs are well-browned, place skillet in oven and cook until chicken is done and sausage is heated through, about 20 minutes. Do not overcook. Remove chicken to a platter and tent with foil to keep warm. Place skillet over medium-high heat, add mustard and chicken stock or water. Bring to a boil, whisking to incorporate any browned bits (or escaped stuffing) and reduce slightly. Season to taste with salt, pepper, and herbs. Remove from heat, and whisk in butter until melted. To serve: After chicken has rested at least ten minutes, remove toothpicks and carefully slice into roulades. Arrange on platter, spoon pan sauce over and garnish with parsley. Serve immediately. The amount of crostini that this recipe will make depends on many things: How big your tomatoes are, how thick you slice your bread, how much bean puree you like on each piece. You can also use canned navy or cannellini beans rather than making your own, but with the no-soak method used here, you don’t have to worry if you didn't prepare the night ahead! While beans are cooking, slice tomatoes in half lengthwise and slice baguette into 1/4- to 1/2-inch slices. Arrange bread on one sheet pan and tomatoes on another. Slice the remaining garlic clove in half and rub cut side of garlic on tops of baguette slices. Place cut garlic clove onto pan with bread. Brush or spray olive oil onto tops of bread, garlic, and tomatoes and salt and pepper to taste. Set aside while beans finish cooking. When beans are done, remove from oven and heat to 425°F. Drain beans, reserving 1/4 cup cooking liquid. Remove onion, garlic, and bacon, if using, from beans. Pull rosemary needles off of stem and add to beans. Discard rosemary stem. When oven is up to temperature, place bread and garlic and tomatoes into oven. Bake about 5 minutes, or until bread is lightly browned on top and sides. Remove bread and garlic from oven. Continue to cook tomatoes for about 10 more minutes, or until they are broken down and slightly charred on edges. Remove pan and set tomatoes aside. To make bean puree, combine beans, reserved cooking water, roasted garlic clove (the one that’s on the sheet pan with the bread slices) and 1/2 teaspoon salt in a food processor. Pulse until ingredients are combined. With processor running, slowly add remaining olive oil until beans are desired consistency. Season with salt and pepper to taste. Slice sausage into 1/2-inch pieces (you should get about 7 slices per sausage.) Add small amount of olive oil to a large skillet and place over medium heat. When skillet is hot, add sausage slices and brown on both sides, about 2 minutes per side. Assemble crostini: Top each baguette slice with about 1/2 Tablespoon bean puree. Top puree with roasted tomato halves and then with sausage slice. Sprinkle with minced parsley, if desired. Bilinski's Healthy "Bubble & Squeak"
This is a terrific healthy side dish and a great use of leftover potatoes. 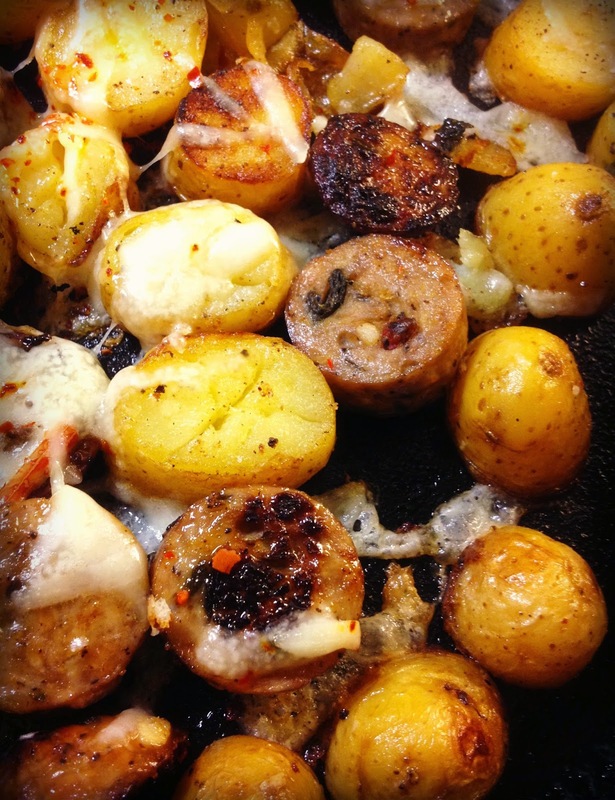 Slicing both the potatoes and sausage into coins adds visual interest to this quick and easy skillet dish. In a medium ovenproof skillet, heat olive oil over medium-high heat. Add potatoes and sausage. Smooth out into single layer, cut side down, and cook until browned. Turn potatoes and sausage over with spatula and/or tongs and brown other side. Season to taste with salt and peppers. Sprinkle cheese over all. Put skillet in oven and cook until cheese is melted and slightly browned, about 5-10 minutes. Remove from oven and serve immediately. My husband's family is from SE Louisiana and they love their dirty rice. Donald Link's Lake Charles Dirty Rice pretty much captures what I was introduced to very early on in my marriage. A key ingredient, chicken livers, give the rice a bold, rich flavor. Not everyone is receptive to them. One of my friends shared that she uses mushrooms as a substitute. She feels they give a similar flavor and texture. Then, lately I have seen several blog post about using cauliflower as a substitute for rice. Crazy, right? All of this helped me in deciding on my recipe today. When we received information about the Bilinski's Kale Balsamic Chicken Sausage Challenge, they shared that they wanted our recipes to reflect their philosophy for "healthy, flavorful and simple." I think you will find that this recipe reflects that philosophy. The cauliflower does not taste or have the texture of rice. I'm not going to try and convince you of that, but it is a healthy AND tasty substitute! The mushrooms in my recipe replace the chicken liver and give a nice texture to the dish. Last, Bilinski's delicious Kale Balsamic Chicken Sausage is a great, healthy and tasty substitute for pork sausage, which is traditionally used in Dirty Rice. With all the healthy substitutes, this dish still got a thumbs up from my Cajun spouse, who loves his Dirty Rice. 1. Finely chop four of the sausage links (you want it to be similar to ground sausage) and set aside. 2. Slice the remainder into horizontal pieces. Brown them in non-stick skillet, drain and set aside. 3. Place cauliflower florets in food processor and pulse until they are finely chopped (riced.) You may have to do this in batches, depending on the size of your food processor. 4. Place riced cauliflower in large non-stick skillet with 2 cups of the chicken broth. 5. Bring cauliflower/broth to boil, then reduce to medium heat and let simmer for 3 minutes. 6. Strain cooked cauliflower, pressing out as much liquid as possible. Set aside. 7. In same skillet, melt 1/2 stick of butter. Add green pepper, celery, onion and garlic. Saute for 4-5 minutes until soft. 8. Add black pepper, chili powder, Cajun Seasoning and oregano. Stir well. 9. Add finely chopped sausage and mushrooms. Saute for 2 minutes. 10. Combine flour with 1 Tablespoon of butter, mix well. Add to skillet. 11. Add remaining 1/2 cup of chicken broth to mixture, stir well. 12. Fold riced cauliflower into mixture. Combine well. 13. Place on a serving platter, garnish with sausage slices and scallions. When I was younger, I hated mushrooms. Hate might not be a strong enough word. I absolutely loathed them and flat-out refused to try a single bite of anything that included them. I remember sitting at my grandparents’ kitchen table for hours, because they wouldn't let me get up until I had at least tried them. It was a pretty epic standoff but eventually, they gave up and let me go to bed, mushrooms untouched. 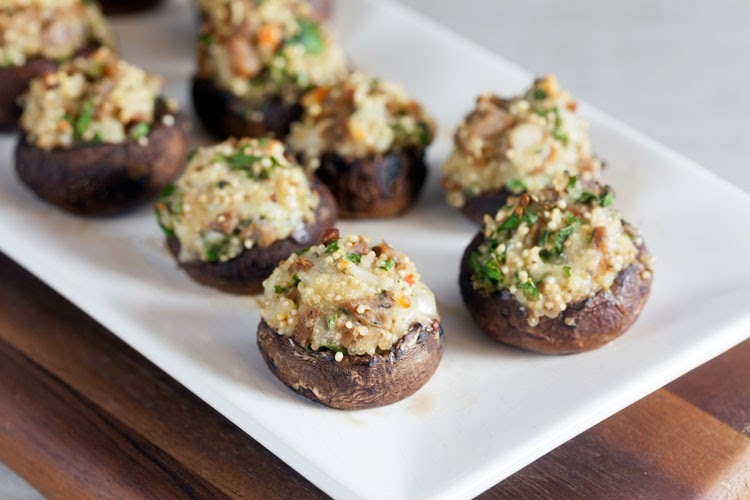 Then one day when I was in my 20's I got a random craving...for stuffed mushrooms. After a mini panic attack (no, I wasn't pregnant) I decided to give them a go. And I liked them! Weird, right? Anyway, I've been eating mushrooms ever since. I enjoy them in everything from farro risotto to bison burgers. 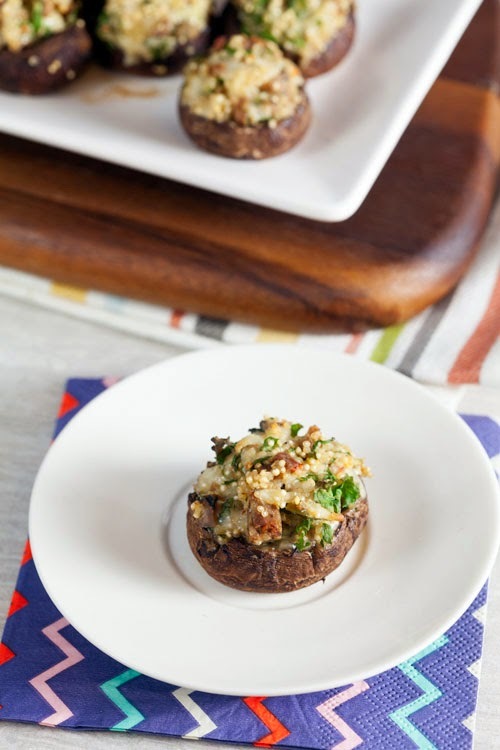 Stuffed mushrooms are one of my favorite appetizers. Heat oven to 350°F. Arrange the mushrooms on a baking sheet, stem-side up. Combine the quinoa and water in a small pot. Bring to a boil; cook 10-15 minutes or until the water has absorbed. Remove from heat and mix in the sausage, kale, and cream cheese. Let cool slightly. Stir in the mozzarella and red pepper flakes. Stuff about 1 heaping teaspoon of filling into each mushroom. Bake 20 minutes, or until the filling is bubbly and begins to brown. Meatballs anyone? I love meatballs, all kinds. So when I was presented with Bilinski’s healthy Kale Balsamic Chicken Sausage, the first thing I thought of was meatballs. Okay, so I tried to stay true to Bilinski’s healthy point of view (so I didn't deep fry them.) I baked these crunchy little gems of healthy chicken kale and balsamic sausages and served them with a balsamic/whiskey and strawberry Bar-B-Q sauce. I hope you enjoy. Mix 1/2 cup of panko breadcrumbs with olive oil and broil at 350°F for 3 to 5 minutes, stirring halfway through, until they are golden brown (but not burned...trust me...you've gotta watch these...they will burn the minute you turn your back on them.) You can also brown them in a skillet if you prefer. Put them in a bowl and set aside. In a small bowl, combine 2 Tablespoons of panko breadcrumbs and 2 Tablespoons of milk. Stir to coat the breadcrumbs with the milk and let it sit for about 5 minutes, until the milk has softened the panko. This is called a panade, but we’re not fancy in my house...we call it the moist maker! Pre-heat your oven to 375°F and line a baking sheet with parchment paper. Cut the fully cooked chicken sausages into 1-inch pieces and put them in a food processor. Pulse about 10 times to break them up. Then run the food processor for about 20 seconds until the chicken sausage looks coarsely ground. Add the eggs and pulse until combined. Add the panade to the food processor and pulse to combine. No need to add salt or pepper because the fully cooked Bilinski's chicken sausage is already well-seasoned. 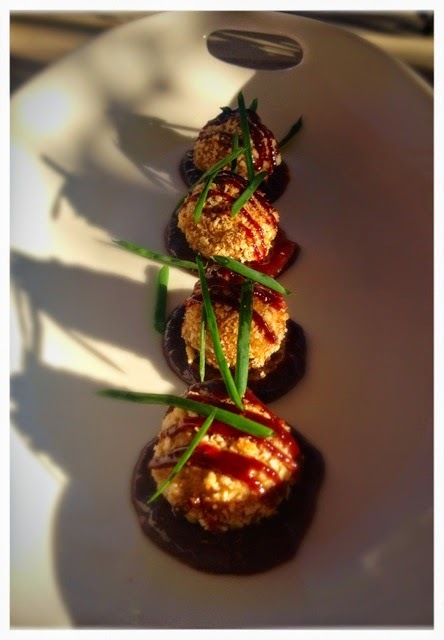 Using a tablespoon-sized measuring spoon, make small, appetizer-sized meatballs (they’re soft, so don’t be alarmed.) Drop them into your bowl of previously toasted panko bread crumbs and turn to coat, then place them on the cookie sheet. Continue to make meatballs, rolling them in the toasted panko, until you have about 30 meatballs. Bake them for 10 minutes, then gently and carefully turn the meatballs over so they can brown on the other side. Cook an additional 10 minutes. Remove them from the oven and let them cool. They will firm up as they cool. Serve with any store-bought bar-b-q sauce or make your own. I made a Balsamic/Whiskey and Strawberry sauce (recipe below) to compliment the balsamic flavor in the Bilinski's sausage. Put the balsamic vinegar in a small sauce pan and bring to a boil, then reduce to a simmer for about 25 to 30 minutes, until the balsamic vinegar is reduced to about 1/3 cup. In a skillet, sauté the shallots over medium heat until tender (about 3 minutes). Turn the heat to low and add the strawberries. Cook for an additional 3 to 5 minutes, stirring often. Add the balsamic reduction and the remaining ingredients and simmer for about 10 minutes. Remove from heat and serve. It's a new year and I know many of you are looking for healthier recipes to get this year started. Sometimes the word "healthy" is translated into "unsatisfying" or "bland", but it doesn't have to! Healthy can be (and should be) delicious, flavorful, hearty, filling and all those other good things that you are craving. Try using a new ingredient each week to expand your horizons in the "healthy" department: Try millet instead of rice one week. Using seasonal vegetables and fruits in dishes also means additional flavor. I wanted to create a healthy and hearty dish that incorporated ingredients that would complement the flavors in the new Bilinski's Kale Balsamic Chicken Sausage! Since moving to NYC and not having an income, I have tried to stretch my food dollar even further than before. One way I've found to do this is to create dishes that incorporate a lot of delicious and healthy ingredients that are filling and re-heat well...you could serve this dish to a family of four or, if you are in a similar situation as myself, have leftovers for a few days (I promise it re-heats very well.) Feel free to change up the ingredients as you see fit. In a small pot bring the chicken broth to a boil. Add millet, reduce heat to low, cover and cook for 20 minutes or until all water has been absorbed. Add 1 teaspoon of olive oil to a large skillet and brown the sausage on both sides. Remove the sausage from the pan and set aside in a large bowl. In the same large skillet, add 1/4 cup water and bring to a boil. Add in sweet potatoes and cook until tender or until water has evaporated. Reduce heat to medium and add 1 Tablespoon of olive oil to pan. Add in mushrooms and cook until browned. Next, add in the pine nuts, and brown lightly. In a bowl whisk together the remaining olive oil and balsamic vinegar. Add 1/2 of the mixture to the pan with the sweet potatoes, mushrooms and pine nuts. Once the vegetables have been coated with the olive oil and vinegar, add in the dried cranberries and kale. Cook until kale has begun to wilt (about 1-2 minutes), remove from heat. Once the millet has finished cooking, add it to the bowl with the sausage. Add the remaining olive oil and balsamic vinegar mixture to the bowl with the warm millet and sausage, toss to coat well. To the same bowl add the cooked vegetables, toss to incorporate all ingredients and serve.